The Golf Blog (www.thegolfblog.com) says: We’re exhausted. Totally exhausted. So many different story lines. Where to begin? 1. Rory McIlroy implodes: After Rory McIlroy brought a 4-shot lead into the final round, the lead evaporated within just about 2 holes. Rory, who would eventually shoot 80, looked like a deer in headlights and could never get untracked. We’ve seen this happen before to final round leaders–Dustin Johnson, Nick Watney, Jason Gore–but it’s always painful to watch. The worst was on the 10th hole, where Rory duck hooked the ball into a tree, causing a ricochet of the ball in between 2 houses near the golf course. 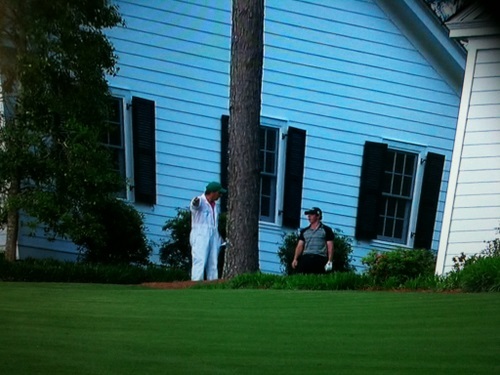 There’s no out of bounds apparently, so Rory had to hit the ball from in between the 2 houses. Rory couldn’t recover from behind the houses and ended up triple bogeying. That was all she wrote for Rory–only he had to play 8 more excruciating holes on his way to a back nine 43, including a four-putt double bogey on 12. 2. Tiger Woods charges with 31 front nine, but falters down the stretch: While Rory McIlroy was imploding, Tiger Woods made a massive comeback and actually was tied for the lead at -10 at one point. With the back nine (which is supposed to be the easier nine) still ahead of him and the most momentum of anyone on the course, Tiger seem poised for his 15th major victory. But Tiger three-putted the short par-3 12th for bogey–which took some steam out of his round. His putter seemed to sputter from there. Tiger clawed his way back with a decent eagle-look from 8 feet away on the 15th, but Tiger’s putt lipped out. He had to settle for birdie, the last he would make. That was it for Tiger. 3. Adam Scott and fellow Aussie Jason Day come close: Then for a stretch it looked like Adam Scott would win. He had the outright lead for a couple holes at -11 and then -12. (We should also mention fellow Aussie Geoff Ogilvy who birdied 5 straight holes to tie Tiger’s finish at -10.) Meanwhile, Adam Scott’s playing partner and fellow Aussie Jason Day birdied the last 2 holes to tie Scott at -12. But by then, Charl Schwartzel had taken the lead. 4. Charl Schwartzel birdies last 4 holes to win. Back-to-back-to-back-to-back birdies–wow! Charl also holed out on the third hole and chipped in at the first hole. So it was his day!! Congrats, Charl! !